The Metta Stomp Warriors, were “conceived” at the beginning of 2009. Even the name Metta Stomp Warriors was brainstormed by the members themselves. During Percussion curriculum time, the members are exposed to making and creating music using daily household equipments, recycled materials and the real percussion instrument as well. The Warriors practiced hard and have come a long way. 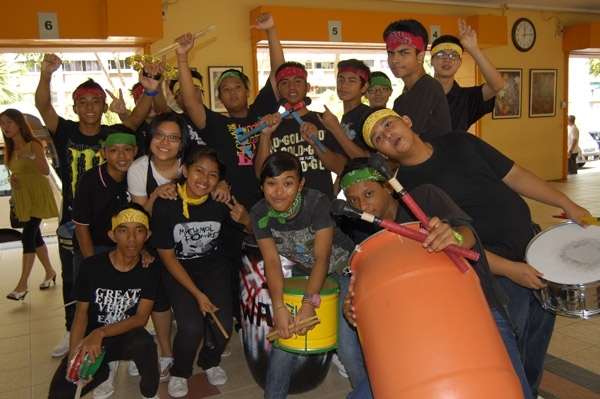 The students have all put in a lot of effort and commitment into many outdoor performances, namely Total Defence Day, Earth Hour and Miss Earth Day in 2009. Last year, in 2010, we have also performed for the YOG Clock Countdown in March, South East CDC District Meeting in June and come August, we will be participating in the YOG Torch Run too.We are all very passionate about percussion and would love the opportunity to perform for everyone.